What do you hunger for? My father knew he was dying. No one else knew, but he did, and he wanted to make memories while there was still time. So the summer I turned 11, he took me to New York. He booked a package deal that included three nights at the Waldorf, two Broadway shows, and a tour of Manhattan. It was my first time in the city, but there was an immediate familiarity I can’t explain. From that moment on, I was determined to make New York my home. My mother said I could go as long as I graduated from high school and paid for it myself. And so I did. I was 16. I found a place to stay: the Markle Evangeline Residence for Women. It sat in the heart of the West Village on a tree-lined street. We were provided with two meals a day and weekly linen service. Most importantly (for my mother, at least) no men were allowed past the first floor. In the summer, students moved out and young dancers and aspiring actresses lived there while attending various performing arts programs. Every morning I would eat breakfast with students studying at the Joffrey Ballet, and a couple of former Mousekateers who were trying to reinvent themselves as serious actors. All of our phone calls went through the main switch board, which was answered, “Salvation Army Markle Evangeline Residence for Women. How may I direct your call?” For anyone who didn’t know better, it sounded like I was living in a women’s shelter. But it was an ideal way for a young woman, not yet legal, to find her way in the big city. Before I left for New York my grandmother insisted that I meet her friend’s nephew who worked in the theatre. We drove down to the river where he was visiting family. Rodger was the executive director of Broadway Cares/Equity Fights AIDS, a philanthropic organization that serves the theatre community. He gave me his card and told me to call him when I got to town. My first job in New York was as a Broadway usher. It was the perfect job for a theatre kid. I subbed around at different theatres, which allowed me to see all of the shows on Broadway that I otherwise couldn’t afford. It was a job that I worked on and off for more than 10 years. For someone who wanted to write for the theatre, it served as a master class. My earliest plays were written by flashlight in the darkness of the theatre. The summer ended and I stayed. Eventually I moved into a rent-stabilized apartment in Hell’s Kitchen. It was my home for eleven years. My mother later told me that she always knew I’d never come back. I asked her why she let me go. 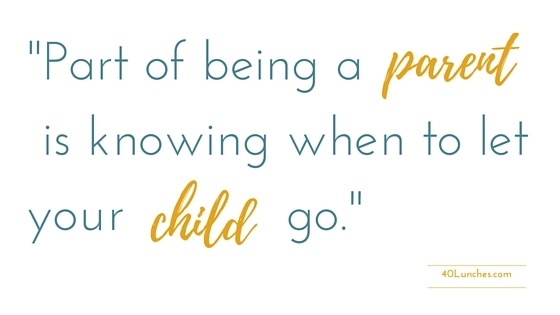 She said that part of being a parent is knowing when to let your child go. She knew I was ready. She had faith in me. On Saturday I will return to the city. The same feeling of familiarity always comes rushing back as I navigate the streets. I’ll stop off at the Little Pie Company for carrot cake, which became a birthday tradition years ago. I’ll scour the shelves of The Strand and the HousingWorks bookstore. I’ll see a few shows and visit with friends. But I’m especially excited for the lunches I have planned. I never had any money in New York, but thanks to a wonderful network of friends I was never hungry. I look forward to launching the 40 Lunches Project, sharing a few stories and paying back a few meals. Wow...Great story. I love how personal you made it. I will share. Thanks for reading and the kind words. I'm really enjoying this project. Elyzabeth is a writer, mother, educator and decent human being celebrating 40 years, one meal at a time.